Enter the Seventh Annual Saline Scarecrow Contest. 2018 Theme : "Star Wars"
Theme is optional, but encouraged. You may choose to enter your scarecrow in one of four different categories: Individual, Group, Small Business or Large Business. Show off your creative talents and win prizes in the process!! Scarecrows will be displayed in Downtown Saline !!!! Entry is FREE and open to individuals, business, organizations and clubs. Register on this website or download forms here. All entries must be delivered to Borer Family Chiropractic at 210 W. Michigan Ave., Saline, MI 48176 between September 21st and October 21st, 2018. Space is limited so don't delay! 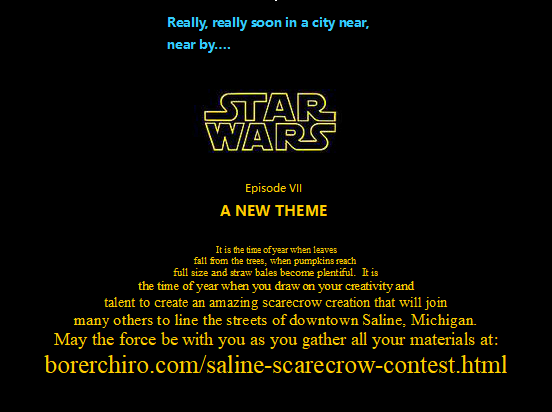 All entries will be displayed downtown Saline from October 1st to October 31st. Vote for your favorite entries to choose winners in four different categories; individual, group, small business and large business. Voting will begin October 16th and continue through October 23rd, 2018 at midnight. Voting may be done online. Voting is open to everyone. One vote per person per day. Check voting status on our website. Votes updated daily, once voting begins. Winners will be announced on October 24th, 2018 at 7:30pm at the Second Annual "Trunk or Treat" in the Key Bank parking lot in downtown Saline. Announcements will also be made on facebook at: https://www.facebook.com/BorerFamilyChiropractic. Right Now! - planning your amazing scarecrow!